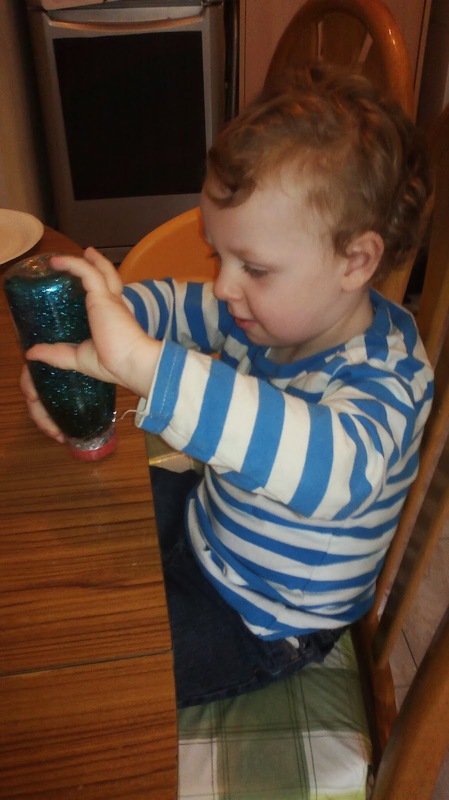 Glitter bottles are very easy and inexpensive to make and make a great sensory toy. They are especially suited for small children but can be used as a relaxation toy for any age group. For example if you have an older child with additional needs, or a teenager who is feeling stressed, giving them one of these to play with while you're chatting to them helps to calm the mind and give the hands something to do. You'll probably have seen them before at organised playgroups as they're a really popular DIY toy for pre-schoolers. You will need a small, clean plastic drinks bottle, vegetable oil, water, glitter, food colouring, sticky tape and I also recommend some super glue to make everything really secure. 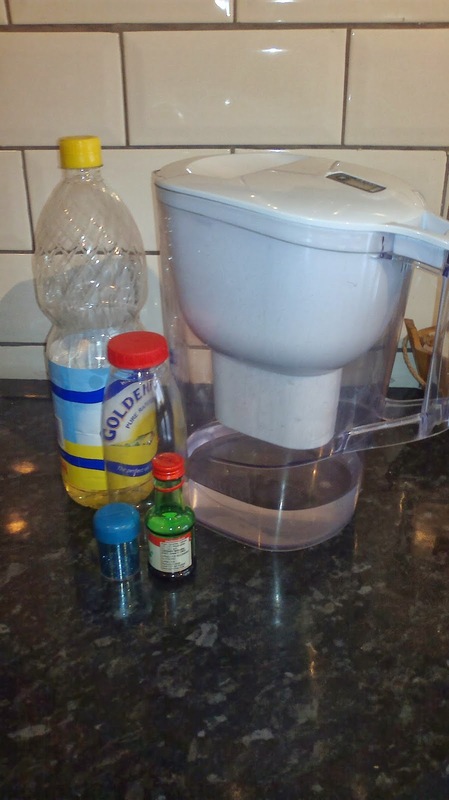 Half fill your drinks bottle with vegetable oil, then add a few drops of food colouring, half a teaspoon of glitter and then top most of the way up with water. I add a little superglue to the inside of the lid and screw it down well. Then you need to tape the lid all around to make sure the kids don't get the lid off. Apart from the super glue, everything is safe for over threes to help with, but use your common sense in letting smaller children help since this project has some small part such as the bottle lid to watch them carefully with. You can add in any other small waterproof items you have, such as sequins and buttons for added interest. You may have seen similar instructions of how to make these which describe them as being like a lava lamp. I've never found ours turn out like lava lamps, more like crazy snow globes. They are very satisfying to play with as the contents swirl peacefully round in random cascades and whirls. This is also a nice science exploration of the different properties of oil and water, such as density and mixing. Children will gain more from it and play with it longer if you sit with them and help them build their descriptive vocabulary by you describing yourself what you can see and asking them descriptive questions, for example "I think that looks like a rain storm on a mountain when you swirl it around, what do you think it looks like? ", "what happens if you turn it upside down/ shake it hard, shake it slowly...". Safety bit: there are small parts, so closely supervise children when making and playing with this. Check regularly for damage and discard if it's looking too raggedy. They will try to pull it apart and if you haven't got it quite right they may succeed in getting the top off, which isn't good news as the contains will stain carpets etc...plus they'll likely try to drink it, so I really mean it when I say close supervision needed. If you're using superglue, make sure you keep kids clear and use it in a well ventilated room.